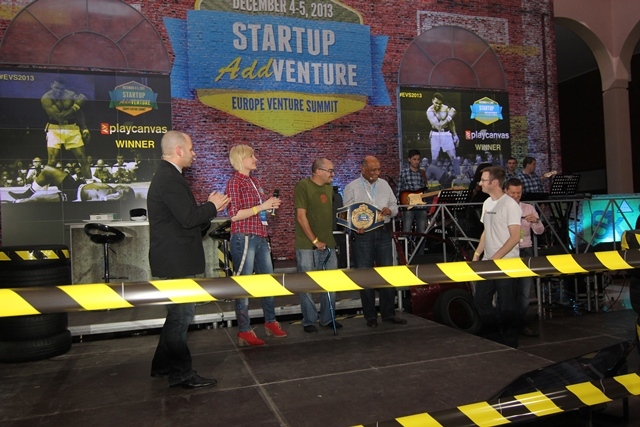 The best European startup was determined during the Startup AddVenture conference in Kiev (Ukraine) on the 5th of December. It turned out to be the world’s first cloud-hosted 3D game development platform – PlayCanvas from the UK. 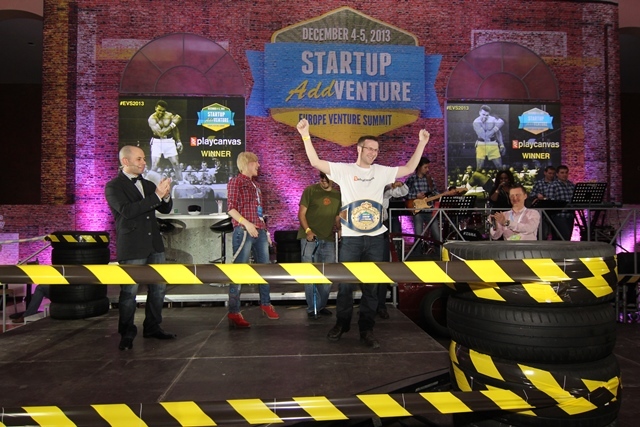 The winners got a €25,000 investment and a real boxing championship belt. A total of 350 teams have applied for Startup Competition through AngelList. A jury of 20 angel investors and seed fund representatives from Europe, the CIS and the US were to decide on the winner. The jury was headed by Dave McClure, the founder of the world’s largest seed fund, 500 Startups (USA) and Kaushal Chokshi, the president of Cross Border Angels (USA). The finalists of the competition have taken a three-day intensive pitching training at Happy Farm Business Accelerator. Ukrainian startup, LeadScanner, is first runner-up and has received a $25,000 investment. LeadScanner is a lead generation tool that helps SMBs find prospecting clients in social media and boost sales. Using proprietary algorithms, LeadScanner finds social media users who have a validated intent to buy specific products or services, and then provides their social contacts to the interested local businesses. It is developed by YouScan team, headed by Aleksey Orap. Landingi.com (Innovation Nest, Poland) is an app that helps you create landing pages for many marketing campaign purposes without a designer or a web developer. AdviceWallet.com (Happy Farm, Ukraine) is a mobile loyalty program. It empowers local businesses to attract, keep and understand customers. In turn, it offers customers great gifts at places they like. Limk.com (Turkey) is a content distribution and discovery platform that helps websites grow traffic while reaching highly engaged audiences. InHiro.com (Slovakia) helps your company find new generation heroes – create a visually attractive job ad with clever hiring and sharing mechanics manage incoming applications with our Social X-Ray and only get the best candidates. ConceptInbox.com (Wyra, Spain) is the best way to share and communicate for designers. Collaboration, project management and version control. Jumpido.com (LAUNCHub, Bulgaria) – is an exciting series of educational games for primary school. It combines natural body exercises with engaging math problems to make learning a truly enjoyable experience. PlayCanvas.com (TechStars, United Kingdom) is the world’s first cloud-hosted 3D game development platform. Priceless.ly (TechPeaks, Italy) promotes celebrity-backed charity fundraising, providing strong incentives for donors to help raise more money for charity/social causes. Moku.io (Italy) is a web platform where students can easily collect, share and visually annotate docs on transparent layers, while keeping an eye on their privacy. We also sell “doku”, our awesome tech that converts and renders docs (PDF, office and others) in pure HTML5. LeadScanr.com (Skolkovo IT Cluster, Украина) is a lead generation tool that helps SMBs find prospecting clients in social media and boost sales. Using proprietary algorithms, LeadScanner finds social media users who have a validated intent to buy specific products or services, and then provides their social contacts to the interested local businesses. Startup AddVenture (Europe Venture Summit) is the international startup conference that was held in Kiev (Ukraine) on the 4th and 5th of December at NSC “Olimpiyskiy” stadium. 50 startup industry and VC rock stars from the US and Europe have attended the event along with over 1,500 IT entrepreneurs, accelerators and investors from Ukraine, the CIS, Europe and the US. The programme of the conference consisted of numerous panel discussions, workshops, Expo and the Startup Competition. Happy Farm Business Accelerator was the organizer of the event. The next Startup AddVenture will be held on the 3rd and 4th of December, 2014. RomanianStartups.com was a media partner with Startup AddVenture.